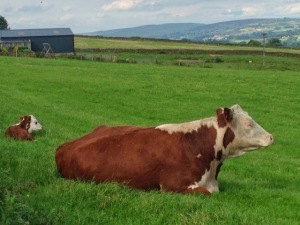 Whilst Toby and I were on our walk today, we stopped to look at, and take photos of this beautiful Cow and Calf. Kath the farmers wife was out and we got chatting, I mentioned how cute the calf was. She told me she was rejected by her mother and how the cow lost its own calf so they put them together. The process is called calving; where the farmer matches a calf to a cow, so the cow adopts and feeds the calf. Happily on this occasion it worked, apparently it doesn’t always. As we were chatting the cow got up with her calf, and they happily walked down the field together. You would have never known they were put together, they looked just like mother and daughter. Isn’t nature wonderful.